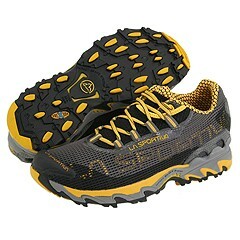 The La Sportiva Wildcat is a supportive, yet offers medium stiffness to tackle all-day treks, rocky scrambles and even adventures races. It features excellent toe protection, grippy outsoles for solid underfooting, which makes the La Sportiva Wildcat great for rocky terrains providing good lateral stability. The La Sportiva Wildcat technical trail runner can sometimes feel a bit clumsy on fast excursions, but the snug and seamless upper and spacious toe area makes up for it by offering a plush feel at any speeds.